This vice face was smiling at me, so I had to take it’s photo. 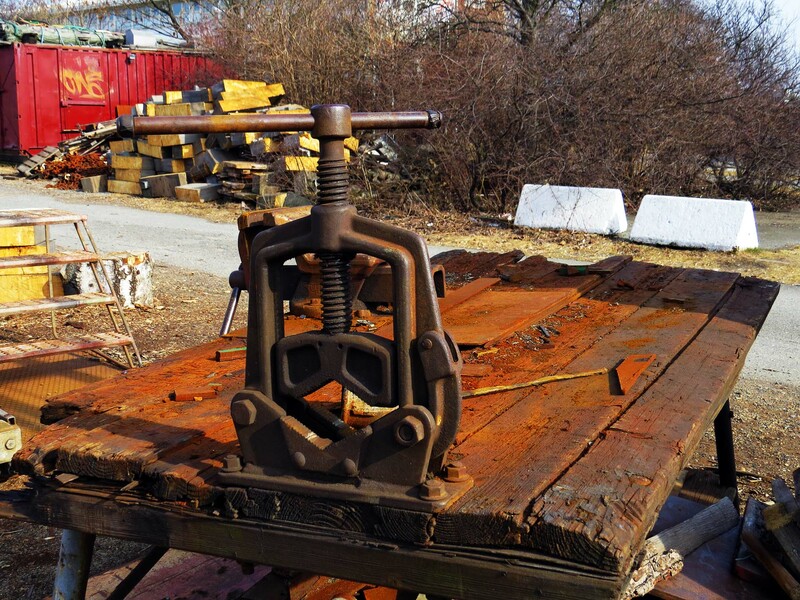 This week’s photo is an old metalworking vice attached to an old, rust-dusted table. Originally published at GBG365 on 15th April 2013. Below is another picture of the same metal vice taken from the opposite side and looking more mundane. 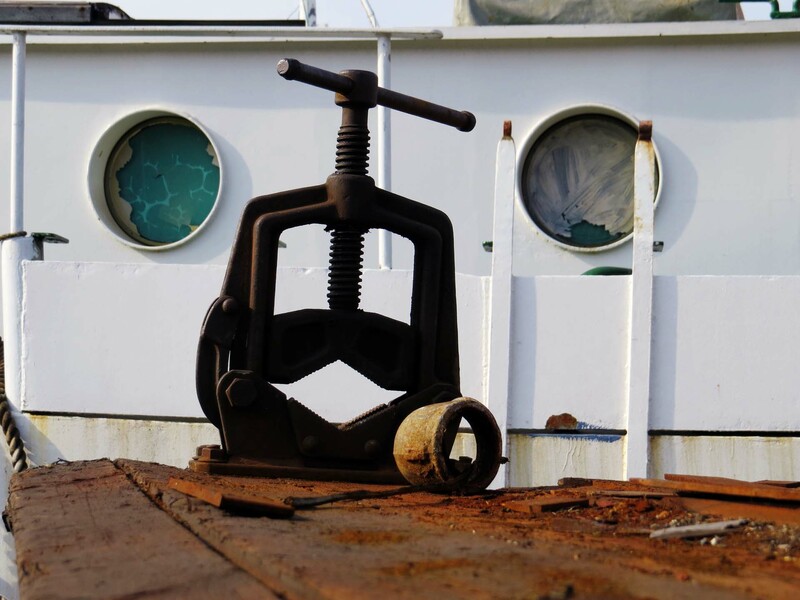 I was on a photo walk – a walk on the look out for photogenic subjects – along Gullberg’s Quay (Gullbergs kaj) alongside the Göta river in the centre of Gothenburg. Gullberg’s Quay is also known as the Quay of Dreams (Drömmarnas kaj) because so many people rent berths there to keep the boats they are rebuilding. Along this stretch of the river the dreams cluster thick as seafog – future voyages and childhoods revisited. Well, that was true in 2013. It may still be true today, but I wonder for how much longer. The part of Gullberg’s Quay closest to town, closest to the old bridge across the river, is now a building site. Or a demolition site just at present. The old bridge, Götaälvbron (a bascule bridge or drawbridge, which opened in 1939) is reaching the end of its life. Some say it’s long past its best-before date. The replacement, a vertical-lift bridge to be called the Hising Bridge (Hisingsbron), is due to open in 2020. There has been a deal of debate over the new bridge. The design has been chosen because it is cheaper and takes up less land either side of the river. But it will put a height limit on river traffic and may need opening more frequently than the present bridge. The new bridge is being constructed alongside the present bridge, and needs a section of Gullberg’s Quay – and a section of Ring Island (Ringön) on the opposite side – for on-ramps. The whole area is scheduled for transformation, renovation and exploitation. After which I’m not sure there will be much room for the dreamers.